Sanku Karna, a divine messenger, used to bring flowers for the daily puja or Sri Maha Vishnu by Lord Brahma. Once when he was late, Lord Brahma got angry and cursed him to be born among demons. Sanku Karna, who was grief stricken, prayed to Vayu Deva (Lord of the Winds) who blessed and consoled him that he will have his blessings and benediction of Sri Maha Vishnu. Sanku Karna was of couse reborn among demons but In Kritha Yuga, he was born as Bhakta Prahalada, in Kali Yuga, he reincarnated as Vyasaraja of Vijayanagar and thereafter, as Sri Raghavendra Swamy. Sri Thimmanna Bhatta was the grandson of Krishnabhatta, a Veena scholar, who had taught the Veena to King Krishnadevaraya. Initially, this couple had two children named Gururaja and Venkatamba. By the grace of Lord Venkateswara, a third child was born in 1595 A.D. at Bhuvanagiri in Tamil Nadu to Sri Thimanna Bhatta and Smt. Gopikamba. They named him Venkatanatha (some also say that he was called either Venkanna Bhatta or Venkatacharya). Venkatanatha proved to be a very brilliant scholar at a very young age. Venkatanatha’s brother Sri Gururaja Bhatta took care of his upbringing after their father’s demise. The initial portion of his education was completed under his brother-in-law Lakshminarasimhacharya’s guidance in Madurai . He was very well versed in bhashyas and debated with various scholars and prevailed over them. He was also a skilled musician and played the veena, which he had learned in his childhood from his father, very well. He used to teach children Sanskrit and the ancient Vedic texts. He never demanded any money for his services and he had to endure a life of poverty. After his return from Madurai , Venkatanatha married Smt.Saraswathi. Venkanna was happy living in the village with his wife, but found himself in a financial stringency at a latter stage in life. Venkanna after his marriage had two-fold anxiety. He has to pull on and also take care of his beloved wife. He had an ambition to become an extraordinary learned man quite well versed in Vedas and was very eager to popularize the teachings of Madhava. He keenly meditated himself on god but was mercilessly nipped by the killing cares and worries of life of poverty. Days and months rolled on. He thought of going to his brother-in-law’s house, but found his wife to be a heavy burden and therefore left the idea. Many a times, he, his wife and child had to go without food several times a week. But this never deterred the faith he had in the Lord. Saraswathi Bai was a beloved wife of Venkanna Bhatta and was totally devoted to him and knew his likes and dislikes. She thanked god of giving her such a wonderful husband and she had all eyes to see the needs of her husband and cater to them. Both of them were highly sensitive. Venkathanatha was suffering from the painful poverty and Saraswathi soon conceived and gave birth to a child and the child was called Lakshminarayana. Poverty life continued and baby boy starved too. Saraswathi got an idea, she told him to meet his Guru and take his refuge. They went to Kumbakonam. Venkathanatha and his family were welcomed in the mutt at Kumbakonam. Venkathanatha mastered all lessons at the Mutt. Swamiji took him to the debates against Adwaita school of philosophy at various King’s courts (Chola, Pandian etc.). Venkathanatha began to write commentary in all three Vedas following Acharya’s Rig Bhasaya, which was his ambition. But the circumstances did not favor his fulfillment. Venkathanatha was the apple of Shri Sudheendra Swami’s eye. He was thought quite well worthy to succeed the Swamiji, who was waiting for an opportunity to tell his disciple of his intentions. Just by the time a disciple named Yadavendra sought the blessings of Swamiji, as he was disgusted in worldly life. Swamiji named him “Yadavendra Theerta ” and he started on the religious tour. At this time, Venkatanatha came to know that a rich man in a neighbouring village was celebrating a happy event. His wife, Saraswathi said to him, “Please attend the auspicious function in the rich man’s house. He will honour you as great scholar and give you some money. Venkatanatha accepted the advice and started for the village. Hundreds pf Brahmins had come to rich man’s house to partake of the feast. Venkatabhattu sat in a corner of the rich man’s house and was reciting some verses of prayer. The family priest of the rich man was a greedy and thoughtless person. It was his duty to prepare the sandal paste and distribut it among the Brahimns. But, as he was busy, he ordered Venkatabhattu, who was reciting the verses in a corner, to grind the sandal paste and went away .Taking it as a divine ordainment, Venkatanatha prepared the sandal paste and gave it to the priest. The priest distributed it among the Brahmins who had come for the feast .They applied the paste to their bodies. No sooner had they done so than they began to feel a burning sensation all over their persons. The rich man enquired of the priest how had made the paste and why it was creating the burning sensation. The priest pleaded ignorance and showed Venkatanatha the person responsible for grinding the paste. The rich man enquired of venkatanatha the reason for the curious occurrence. Venkatanatha calmly replied, “I was reciting ‘Agnisukta’ while grinding the paste perhaps that made the sandal paste give out a burning effect”. He later recited “Karuna sukta” and ground a fresh paste, which was distributed to the Brahmins. When the Bhrahmins used it over the bodies, they got over their burning sensation and felt the paste very cool and pleasing .The rich man realised the divine power and greatness of Venkatantha . He treated Venkatanatha to a rich feast and gave him a reward of a hundred rupees. Shri Sudheendra Swami was a genius of extraordinary and a soul of high spiritual efficacy. One day, he dreamt that Shri Mula Rama ordered that Venkathanatha alone could fit to rule the Mutt. One day he called Venkathanatha and after preliminary discussion of worldly interest, Swamiji began to reveal his intentions. Swamiji started with telling Venkathanatha that god was pleased with him and he deserves a post as the head of the Mutt. Venkathanatha could not understand the intentions of Swamiji and requested Swamiji to be clear of his intentions. Swamiji began to explain that there are many boats to ferry us across the ocean. But to all these our blessings are the sails which move the boats with great force and speed. Now why tarry on the shore? What fear is there to cross the Ocean? Venkathanatha could not understand. Shree Sudheendra Theertha knew that Venkathanatha loved his wife. When he explained clearly of his intentions, Venkathanatha expressed his inability and for renunciation, detachment was essential. So Venkathanatha explained about his wife, son and his shoulders were still young to take up the administration and responsibility of the mutt. So he was not inclined to take holy orders and take up Sanyasa. But was ready to submit himself to the mutt and Swamiji. Time came now for Venkathanatha to succeed his Guru as the next Swamiji of the Mutt. Venkathanatha had a blessing of Sharada Devi, the goddess of Learning and that led him to realization of self and he narrated his experience of Sharada Devi to Swamiji and decided to do Upanayana to his son and accept sanyasa. 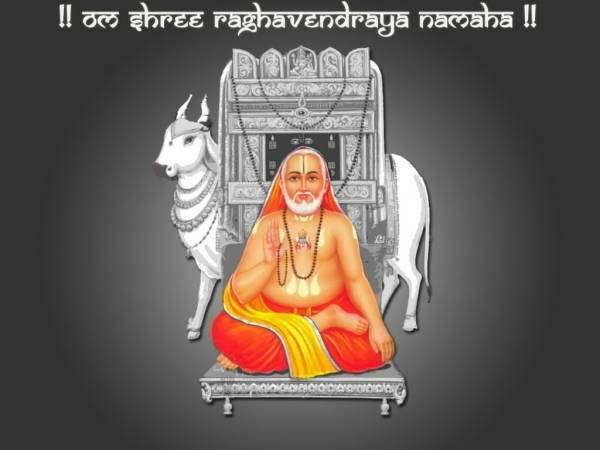 He took sanyasa and Guru named him guru Raghavendra theertha. On the day Venkatanatha was to ascend the peetha, Saraswathi was required to stay at home. However, at the last minute she was seized by a desire to see her husband’s face for the last time. She ran towards the matha throwing caution to the winds. Unfortunately, deeply engrossed in the desire to see her husband, she did not see an old and unused well on the way, and fell into it. She drowned and died. Since her death was an untimely one, she became a ghost. Even as a ghost, her only desire was to see her husband and so she went to the matha. By the time she arrived, the function was over Venkatanatha had become a Sannyasi under the name of Sri Raghavendra Theertha. Sri Raghavendra sensed his wife’s presence immediately and sprinkled some holy water from His Kamandalu on her, granting her moksha or liberation from the cycle of births and deaths. This was her reward for a lifetime of dedicated and selfless service to Sri Raghavendra. 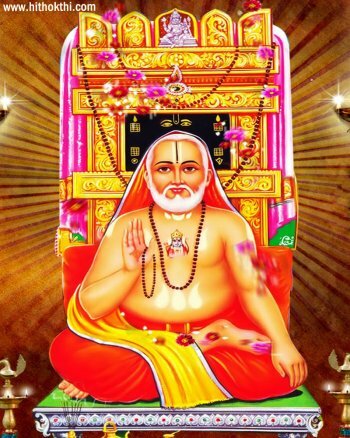 The miraculous healing powers of Sri Raghavendraswamy spread far and wide. Some unscrupulous and mischievous boys wanted to test the Swami. On his route, one of them lay down pretending to be dead fully covered by a white cloth. The understanding was that he should not get up when Swami sprinkled water and asked him to rise. He should get up when the command was given by them. The drama was enacted and wailing friends asked Swami to revive the boy. Swami simply said that his life span was over and hence nothing could be done. He was indeed dead and did not awaken when the mocking gang asked him to. In Sirasangi, a gentle man with an intention to test his powers, gave him a wooden rod covered with steel caps at both ends, and asked him to make it grow into a plant. After meditation, Swami planted it in the soil and sprinkled holy water on it. The dead wood started sprouting. Out of profound regard for Sri Raghavendraswamy, the Badshah of Bijapur, presented a rare gem-studded golden necklace. The Swami offered it to God and placed it in the Yaga Kundam. The Badshah was much annoyed and expressed his feeling. The Swami put his hand in the fire, retrieved the chain in the same condition and gave it back. Some days later, once, the swami was teaching his pupils. He suddenly rose up, looked up, asked some thing and sat down again. The disciples were perplexed. They said to the swami, ” What is it? Kindly explain to us.” The swami said to them, “The great sage Krishna Dwaipayana, was riding in a chariot and proceeding to vaikuntam. On the way, he appeared before my vision. I bowed to him and asked him, “How long yet am I to endure in this physical frame? By way of answer he showed two fingers and waved them thrice. I understood his purport and bowed and sat down. I shall live from now only for two years, two months, two days. Then I shall enter the Brindavan.” The disciples had great devotion for and faith in heir guru. They were grieved to think that their guru would depart from them soon. They were pained beyond words. After some days, When Sri Guru Rayar was proceeding to Adoni, Venkanna, a cow-herd boy prostrated before him. 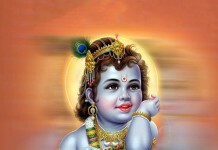 The Swami blessed him and advised him to pray at the time of adversities. After a few days, the Nawab of Adoni, who was passing by, stopped and asked Venkanna to read a message from the neighbouring King. The illiterate boy expressed his inability to read. A furious Nawab threatened to kill him if he did not read. Venkanna earnestly prayed to Sri Raghavendraswamy to save him. Most surprisingly, he read the entire text. As there was very good news in the message, the king made him the Dewan of Adoni. After learning about the miraculous powers of Swami, the Nawab decided to test him. He told his Dewan to take him to Guruji. He took meat on a silver plate covered with a silk cloth and offered it. After sprinkling water, Swami asked his disciples to remove the silk cloth revealing fruits. The Nawab fell at Swami’s feet soliciting his person. Also he requested the Swami to ask for any favour or gift. Guruji asked him to hand over Manchala village, which has come to be known as Manthralayam. It is at this holy place that Bhakta Prahlada performed a great yaga. Guru guru Raghavendra was great in every respect. He was siddha Purusha (God realized person). He started performing miracles, Blind got their eyesight, Deaf could hear. As the time approached for Swamij and he was 78 years old. It was Thursday, the full moon, He announced to all his disciples that he went by the orders of Shri Hari and he decided to leave this world. Devotees from all over the world came to see him as the news spread. 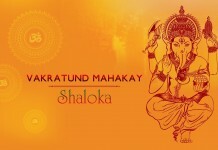 On the second morning of Shravana, finished his morning religious rites and called all his devotees and said. This is our last day. Don’t’ be grieved. It is the order of Shri Hari that we should stay in this world to safeguard the interests of our faith. But we cannot stay bodily outside beyond a limit a certain limit as that would be against the rules of the present age. There fore we are going to enter Brindavana bodily. To the last be faithful and be loyal to your God and religion. May God Bless you with all the things good. Thus he advised them. It was now mid-day. He distributed the theerta and blessed everyone. He called Venkanna Diwan and a prime devotee and gave him a parting message.”Venkanna-I am going to enter the Brindavana in an yogic posture and continue to do Japa (prayer) with a Tulasi Mala (Japa Mala/Chain of Holy beads) in the hand. When I stop the prayer place the 1200 Lakshminarayana Saligramas (Holy Stones) in a bronze container and Mrutike (Holy Sand) on my head and close it with a lid and then place some sand/mud. Venkanna was also entrusted by the Guru to build his Brindavan at Manchala (now Mantralaya). Swamiji asked Venkanna to put a stone on which Lord Rama had sat during thretha yuga as the base. In the afternoon, when the time was auspicious, Swamiji sat in a Yogic posture and started prayers. The Brahmins were reciting Vedas and Shastras. Venkanna and others were supervising the activities. All eyes shed tears of joy and grief simultaneously. As per the Swamiji instructions the stones were placed above his head as he sat in yogic posture. Thus Swamiji entered the Brindhavan bodily. As per Swamiji’s advice that very day was observed as Maha Samardhana Day. 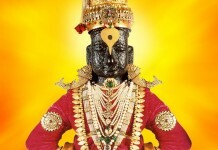 He was to live in atma form in the Brindavan for next 700 years to come. In the Year 1671 AD, Guru Raghavendra named Yogeendra as his successor and entered the Brindavan. After Swamiji entered, his disciple Appanacharya sang the praise of his Guru and seeing the Guru’s Brindavan, He could not speak, the last verse of the song was completed by Guru in the Brindavan. Still Guru Raghavendra continues to bless people who think of him in their troubles and happiness. Previous articleWhat Do The Three Strands Of The Sacred Thread Represent?